I was able to go to Mass by myself. Okay, so maybe it's loveliness was somewhat tempered by the reason I was by myself... I am one of the only people unscathed by the bug that's going around our house, and so I was the only one to slip out into the snow to brave the cold to go to our parish. The day started with a lesson. If, when you're getting ready to go to Mass, you kneel down to pick something up and put your knee in tea that the four year old spilled, make sure to dry you're knee off before stepping out into the sub-zero (with windchill) temperatures (also, tights are always a good idea... mine however are hidden in the reorganization going on in the basement, so tight-less I was). Lesson learned. Mass was beautiful. And it was more than the fact that no one was crying or whining or pulling my hair. I've mentioned in the past few weeks that our ordinary form Mass is now said ad orientem. Well, today's Mass went a step further and today we had a schola that sang a good portion of the Mass in latin... and as I said at the start of this post, it was lovely. And our pastor mentioned that it's going to be happening once a month. A part of me hopes it might become a every Sunday thing, in at least one of the three Sunday Masses. Now, since this is a WIWS post, I probably should mention what I'm wearing. 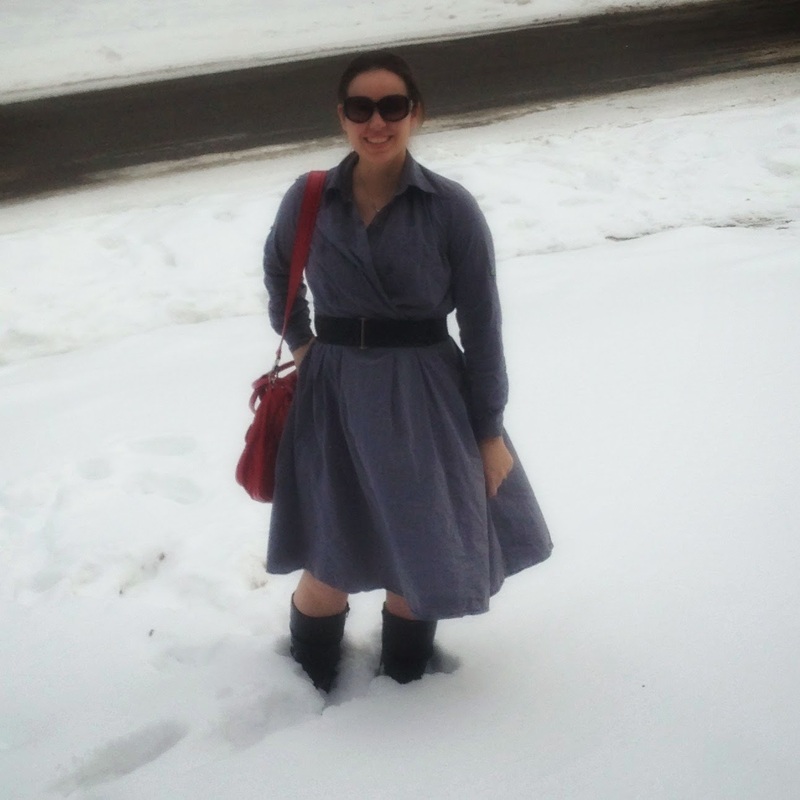 Today I wore one of my favorite, most forgiving (in other words, I can fit into it) post partum dresses. It's one that I purchased from Thred Up shortly before finding out I was expecting James. I paired it with a belt from Target, my water proof leather boots and my new (also from Thred Up) diaper bag! I have to run and find out why the girls are telling me my presence is required upstairs immediately! I hope you are having a great Sunday and for more WIWS head over to FLAP! Great news about the movement toward the beautiful traditions of the Church in your Mass! It's so amazing to see the changes being added in. I already was really impressed when we first started attending our parish, but I find myself pleasantly surprised so often! Thank you! And I definitely need to head downstairs to fold laundry and find my tights! Thank you! And thank you for hosting!